The world's first solar airport no longer pays for electricity | West Coast Solar, Inc.
Fed up with their hefty electricity bill, managers at Cochin International Airport in southern India took matters into their own hands. Three years ago, they began adding solar panels — first on the roof of the arrivals terminal, then on and around an aircraft hangar. The success of those initial efforts led to a much bigger endeavor. “We wanted to be independent of the electricity utility grid,” Jose Thomas, the airport’s general manager, told CNNMoney. Last year, the airport commissioned the German company Bosch to build a vast 45-acre solar plant on unused land near the international cargo terminal. 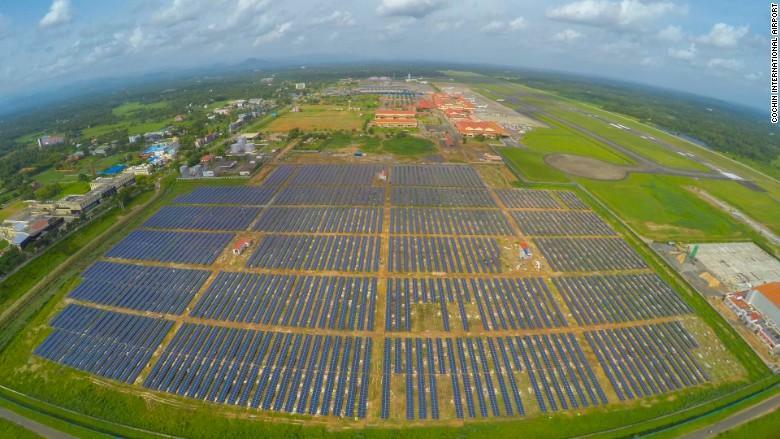 The plant came online in August, making Cochin the world’s first fully solar-powered airport. The tens of thousands of panels generate on average slightly more than the roughly 48,000-50,000 kilowatts of power that the airport — the seventh busiest in India — uses per day, according to Thomas. Surplus energy is fed into the wider electricity grid. The big project cost around 620 million rupees ($9.3 million), a sum the airport expects to save in less than six years by not having to pay electricity bills anymore. It also estimates the solar plant will avoid more than 300,000 metric tons of carbon emissions from coal power over the next 25 years. At a time when solar power has become much cheaper in India, Cochin’s initiative has drawn national and international attention. Indian Civil Aviation Minister Ashok Gajapathi Raju visited Cochin in January and told reporters that authorities have directed other airports around the country to start using at least some solar power. Kolkata’s international airport, which is bigger and busier than Cochin’s, is planning to build a solar plant covering as much as 70 acres this year that would reduce its electric bill by a third, according to Siga Judson, the airport’s general manager. Cochin has received a visit from engineers from Liberia’s airport authority who were interested in the solar installation. George Airport in South Africa, meanwhile, is developing a solar project of its own. Thomas said airports generally have plenty of vacant land that can be used for solar panels. But he said it’s a lot easier for smaller facilities to become fully solar-powered because they use less electricity. Cochin is already working to expand its solar-power base to meet increased demand from a bigger international terminal it’s building. One smaller new plant is expected to be ready by the end of April, and the airport is also planning to put reinforced concrete over a canal and cover it with panels. “We want to continue our status as a power neutral airport,” Thomas said. – Huizhong Wu contributed to this report.